Here is one notice released on his official website. So that at least you'll have an idea what songs to hear and what type of genre it would be. ^^ Each song has a description on it so as early as now you'll know. 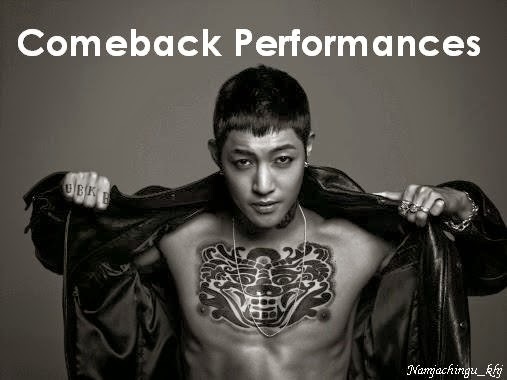 Hiphop Hyun Joong? Hmmmm.... are you already thinking or imagining what he would look like? We'll see. ^^ 김현중 화이팅!! Half of the year has passed by and in a blink of an eye, it is July already. Hope that everyone will take care of their health in the summer days, where the heat is so severe now. We have confirmed the album release schedule for his 3rd mini album ‘ROUND 3’, here are the details. The 3rd mini album ‘ROUND 3’ which we had ambitiously prepared for about 2 years, is a strong yet smoothing album that differentiates Kim HyunJoong’s unique attractiveness. We hope for lots of interest and love from all the fans on his 3rd mini album ‘ROUND 3’. - Pre-order websites : Synnara, Yes24, Hottracks, Interpark, Evan Record, Lees Music, Libro, etc. Cross-over hip hop genre balanced by urban genre with powerful symphonic orchestra sound, this song is gaining attention as it is composed by Steven Lee and European composers Goldfingerz, Jimmy Richard, and featuring Jay Park in it. Sad lyrics and melody that sets it apart from others, this is an urban R&B pop style song. The best local talent rapper Dok2 is featured in this song. It is the title song of Kim HyunJoong’s official 1st Japanese album which won 1st on Oricon chart last year, but the song will be reborn with new arrangements (of the song) different from the modern rock style of the existing song released in Japan. A mid-tempo ballad song composed by the famous Gen Rubin and Jean T.Na, who are the composers of Grammy Awards winner Mary J. Blige. The mid-tempo ballad has a beat that leaves a deep impression, and is arranged with acoustic guitar for a soul feeling. Look forward to a sorrowful couple dance performance which is choreographed by the famous couple Keone & Mariel Madrid. British composer Marli and Denmark singer Rasmus Thude participated as composers in this urban pop song with a hip-hop element. Main feature for this song is where the mind of a witty man’s affection for the woman he loves is expressed humorously in its lyrics. Smooth and refreshing R&B pop genre, a song that contains the confession of an excited man. Included in Kim HyunJoong’s 1st official Japanese album, this song has been reborn with a new sound mix. Dance song with light fast rhythm and synthesizer arpeggio sound. Together with lyricist Kim JiHyang, who is famous for her trendy style of lyrics such as for Lee Hyori, Baek JiYoung, 4Minute, etc, the song will attract attention with its refreshing way of expression of a man’s mind about boldly going after a lady. This song and “I’m Yours”, “Your Story” were all included in Kim HyunJoong’s 1st official Japanese album and 2nd single.